With the Karcher K 2.350, you no longer have to rely on your garden hose and hours of scrubbing to clean the deck, patio or furniture. This compact, electric commercial grade pressure washer delivers 1600 PSI, which is about 30 times more than that generated in a garden hose helping you tackle difficult housekeeping projects like the driveway, deck, patio and sidewalk with ease. It comes with the Vario Power Spray wand to deal with any surface type with the ability to increase or decrease pressure as and when required. When it is time to rinse away detergent use the DirtBlaster wand that suddenly increases pressure by 50 percent. The K 2.350 is the lightest electric washer at present with a compact footprint and 14-pound total weight. This is the ultimate solution for urbanites. Be it carrying the Karcher power washer around or using it in actual applications, the Karcher K 2.350 is an awesome innovation. It brings dual wand operation seen in its X series to this line with a reduced footprint and less weight. Changing between wands, starting the device, increasing or decreasing the pressure, everything works great with hardly any complicated maneuvers necessary. I found the instructions properly detailed and each part clearly labeled as to what it does. The commercial grade motor on this Karcher might not be as powerful as those seen on the 5.540 or 3.540 but it does the job. Where it really excels though is in the noise department. This is the quietest of all Karcher pressure washers I have seen. Previously I thought the X-series was quite but this takes it to the next level. The hum emanating from the engine is barely audible. Okay so the Karcher K 2.350 had to cut corners somewhere in order to deliver an affordable inexpensive washer. They compromised in the power department offering only 1600 PSI at an average GPM, which is not actually that bad. Majority of home chores such as washing the patio, sidewalk, floor, and furniture really does not require more than 1600 PSI. So, you only miss out on tasks that need slightly more pressure such as the garbage can or sidings. Naturally, with reduced pressure, there is a limitation on what all tasks you can perform. 1600 PSI lets you wash your car interior, exterior, sidewalk, patio, flooring, furniture and odd objects such as power tools. But it won’t work well where high pressure is a must such as with the backyard grill or sidings and gutters. Having said that I found the two wands worked well in tandem letting me finish most of my household chores without relying on my large gas pressure washer even once. Two features that stand out the most with the K 2.350 are its trigger sensitive power control and the pressure dial. In this model, you can literally control the pressure and at the lowest setting, it automatically activates the siphon tube to spray detergent. And if you release the trigger at any point of time, it cuts off the motor prolonging pump and motor life. 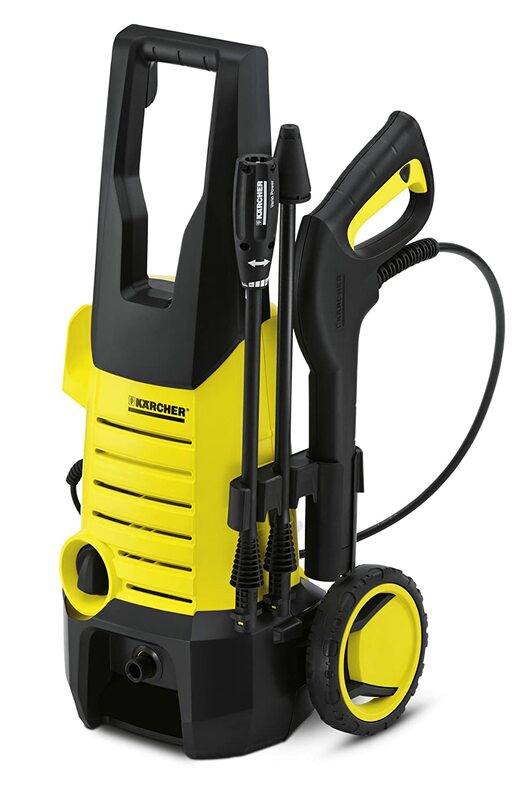 Where the Karcher K 2.350 fairs better than the X-series top models is in terms of durability. Considering its tiny price tag and its lightweight design, this washer does not fall on its face and neither does it break easily. Parts last just as long as the X-series but they are less expensive to replace and readily available. Hence, the additional one star over X-series. Karcher customer support has been superb all the time. Even with the K 2.350, customers felt satisfied each time they called Karcher. Be it for broken parts, warranty calls or simple inquiry and questions, their tech department never puts a caller or mailer down. I have already talked about Karcher’s care to elaborate the difference in its X-series models so I don’t think it is necessary to say anything more. In short, Karcher customer care rocks! Wheels add portability on any kind of terrain. Motor only operates as long as the trigger is pressed. Reduced noise and lower power consumption. Dual wand operation with the VPS and DirtBuster Wands. At the lowest pressure, it automatically siphons detergent via the siphon tube. Compact size, easy to use, just enough pressure for basic tasks and reduced power consumption than before. The gun and pressure hose are shorter than in other Karcher models. Leaks at times from hose connection. If you are very serious about getting a pressure washer because you don’t own one then you may well be disappointed with the maximum output produced by the Karcher K 2.350. However, if you need one for common home tasks then you will protect this washer with your life. The design, construction and idea behind the washer is completely geared towards domestic application of all kinds. The dual wand operation with its lightweight nature makes it easy cleaning inside and outside the house. Best of all you hardly pay anything to procure it.